In addition to newly manufactured rally computers, odometers, checkpoint clocks and speedometers, Timewise is also your source for a used rally computer and "new, old stock" rally equipment and accessories. Used items include "A" class rally computers, "B" class rally odometers, Great Race style rally speedometers, checkpoint clocks, mechanical odometers, rally reader boards, reading lights, odometer transducers, one of a kind "end of production" items, and other accessories. Not all items are available at all times. Please contact Timewise for details on any of the items listed below. Most items listed are used, but a few are "new, old stock" or even "mint, new in box". Each item is a "one off" unless a notation specifically states otherwise. The list is updated whenever an item is sold or when a new item becomes available. This page last updated on Friday, June 15, 2018. Some of these items were manufactured by Timewise, but many are from other rally equipment providers. Items manufactured by other rally equipment providers have been acquired in order to compare product features or to check interconnection compatibility. A few items are being sold on behalf of the actual owner of the product. Any such items are listed solely at the discretion of Timewise. When such an item is sold, the payment will be to Timewise. Timewise will then send the funds to the owner of the product, less an appropriate handling fee plus any repair costs incurred to make the item saleable. Regardless of the ownership of the item, every product is located at Timewise and every product has been checked for proper functionality. Unless otherwise stated, all items will function "as new". Prices are set to reflect the overall appearance, durability and expected lifetime of the product. The item's age and uniqueness may also be considered when setting the price. Regardless of its condition and age, every item is fully functional (unless specifically stated otherwise). Electrical connections and functionality will have been confirmed. If needed, electrical connectors will be reconditioned, repaired or replaced. If the buyer desires a specific electrical connector that differs from what is supplied with the item, arrangements can be made to change the connector. If an instrument has an original or copy of its instruction manual, this will be so noted. All products are sold "as is". Nevertheless, unless specifically stated otherwise, every item is guaranteed to function upon delivery. Items may be returned only if damage caused by the shipping carrier can be documented. Costs for returning an item due to shipping damage is not refundable. There is no further warranty, implied or otherwise, of usefulness, applicability, or longevity of functionality. Fitness for purpose is up to the buyer and must be determined prior to making the purchase. No returns are allowed for erroneous purchases. Shipping charges are extra. Timewise will recommend the safest and least costly shipping method, and will add to the invoice only what the carrier charges. Generally, US Priority Mail shipping to locations within the US is the least costly. Upon request, shipping insurance may be requested and added to the invoice. International shipping via Registered Airmail is recommended. Of course, any requested shipping method can be arranged. The invoice must be paid in full prior to Timewise shipping the product. The cleaning, re-calibration, refurbishing, adjusting and/or lubrication service work peformed on some of these products is part of the sale price. The work sometimes amounts to several hundred dollars, and must be considered when making price comparisons. The condition of each item listed is based upon a rating system which is primarily intended to insure that buyers will not be disappointed following a purchase. The rating system is conservative and should help eliminate an inadvertently misrepresented item. This general purpose rating system is designed to apply to a variety of products so not every comment or feature applies to every item. Mint/New ...The condition is as when new. All parts present. Original manual present and in original condition. Note that some products, even when newly delivered from the manufacture, do show some defects in the original fabrication process. Original box not necessarily present. Excellent ...Only a few very light scuff marks on plastic, metal, or painted surfaces. All parts present. No breakage, although physical mounting points can show scaring due to previous mechanical attachment. Front and rear panels essentually scar free, although a minor scuff or two from handling or fingernails is allowed. Electrically and mechanically, everything works as it did when new. Original or copy of manual present. Labeling overlays all preset. No duct tape residue, grease, oil, or dirt on surfaces or cabling. Very Fine ...No dents or deformation of the base material, only minor wear to the surface paint or plating. All parts present. Scratches allowed on plastic or metal parts. but no gouging. Paint or anodizing may have mottling or uniform fading due to sunlight. Physical mounting points can show serious scaring due to previous mechanical attachment, but such scaring does not interfere with future installation or operation. Front and rear panels may have a number of scuff marks due to handling, and perhaps one or two small scratches or chips. Instruction manual present but shows significant usage. Labeling overlays all preset, but may show signs of lifting at edges. Electrically, everything works as it did when new. Mechanically, everything works as it did when new. Some duct tape residue, grease, oil, or dirt on surfaces or cabling. Fine ...No severe dents, but paint or metal surfaces can be scarred, making appearance somewhat distracting to the casual observer. All significant parts present...missing accessories can be replaced. Manual may not be present. Electrically, everything works as it did when new, but a defective display character might need to be replaced. Mechanically, everything works but perhaps with sloppy or sticky movement, or with some effort. Duct tape residue, grease, oil, or dirt on surfaces or cabling distracts only from appearance and not fuctionality. Very Good ...Works, although electrically a switch or two might not operate properly thereby suggesting or requiring replacement. May have a few defective display lights or characters. Mechanically, some effort is required to manipulate a part, or parts are bent or deformed. Front or rear panels can have some damage, but the item man be used "as is". Good ...Looks and functions as a well used item. Needs electrical and/or mechanical servicing to return to full functionality. May be used "as is", but not recommended. Fair ...Worn out. extreme loss of paint and/or anodizing. Electrically, some functions do not work, but it's likely that repairs will rectifiy the electrical defects. Mechanically, some re-fabrication and switch replacment will be necessary to return the item to functionality. Cannot be used "as is"...repair needed. Very Poor ...In such terrible condition that it cannot even be used for parts. Used items sold since February 2013 include: two TerraTrip rally odometers, three Timewise 796A rally computers, two Timewise 797A rally computers, three Timewise 798A rally computers, three Alfa checkpoint clocks, two Steven's Wheels, four Alfa E-Z Pulse Odometer transducer, seven Timewise magnet sensing transducers, two Butler gooseneck lights, a Timewise 496 pulse divider, two TimeMate 96 Odometer Signal Duplicator/Switcher, a Quantum rally computer, two Zeron 880 rally computers, a Zeron 88 checkpoint clock, an Alcan 5000 winter jacket, and many transducer adapters and power cable connectors. 2 pin SAE power plug to CINCH S-304-CCT socket adapter cable ... 12V power 2 pin SAE to CINCH S-304-S socket adapter cable. Includes in-line fuse. 6 inch cable. The CINCH S-304-CCT socket mates with the CINCH P-304-CCT power plug used on vintage Zeron rally computers and odometers. Excellent condition. 2 pin SAE power plug to CINCH S-304-CCT socket adapter cable ... 12V power 2 pin SAE to CINCH S-304-S socket adapter cable. Includes in-line fuse. As above, but with 3 ft cable. The CINCH S-304-CCT socket mates with the CINCH P-304-CCT power plug used on vintage Zeron rally computers and odometers. Excellent condition. Timewise Model 215.5-7 Speedometer Cable Transducer ... New, never used, heavy duty speedometer cable sensor; 7/8" x 18 tpi M/F fittings; adaptable male/femaie drive keys, 7 ft cable. This 7/8" x 18 tpi model is the only one available, as these rugged duty speedometer cable transducers are no longer manufactured. Normally, an 8 contact RJ45 Modular Plug terminates the cable but that connector can be replaced with a different style connector for an appropriate fee. Mint condition. 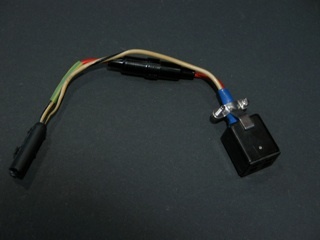 Note: The Model 215.5-7 speedometer cable transducer requires one each of a male and a female drive key. Keys are purchased separately. Specify either .105", .125", .150", or .187" square key or .152", .187", or .203" tang key. Some drive key sizes/types are no longer available. Contact Timewise for details. Timewise Model 133-13 Extension Cable ... Odometer transducer extension cable; 13 ft heavy gauge shielded cable with CINCH P-303-CCT plug on one end and CINCH S-303-CCT socket on other end. Mint condition. 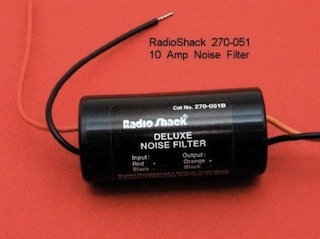 Radio Shack Archer 270-051 Noise Filter ... Passive electrial noise filter for 12V vehicles. 10 Amp, iron-core choke, 164 microhenries / 33 milliohms DC resistance. The filter is a pi-configuration with a 1uf input capacitor and 2200 uF output capacitor. 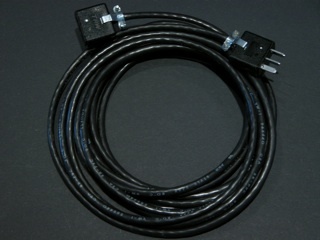 Terminated on one side with CINCH P-304-CCT plug, other side unterminated, 3 ft total length including wiring. (Stock Photo does not show wiring.) Fine condition (Label partly damaged). 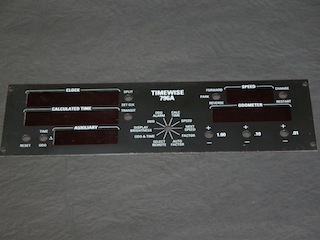 Timewise 796A Replacement Front Panel ... Original 796A front panel for replacement of a worn panel on your 796A. Two available with glossy finish red LED windows and satin finish everywhere else - Mint condition.